Across the rippling, crevassed whitescape of the East Antarctic Ice Sheet, two unusual shapes appear in this grayscale satellite image of the frozen continent. 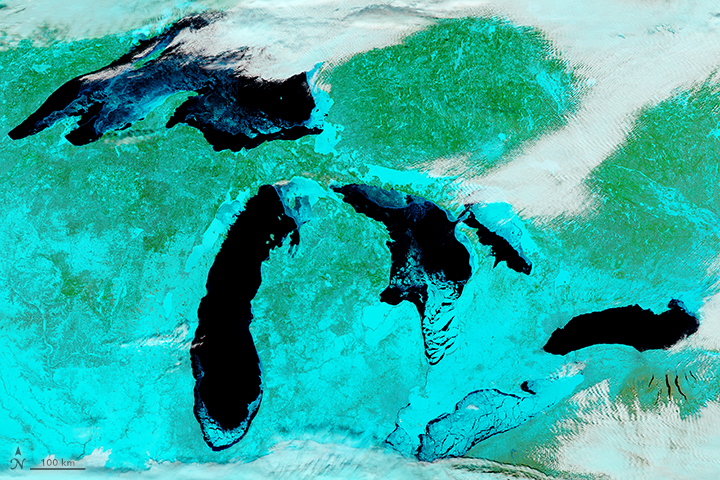 The smooth, dark gray oval shapes are slight depressions in the surface of the ice sheet that trace out the shorelines of two lakes that are buried several thousand meters (more than 2 miles) deep in ice. 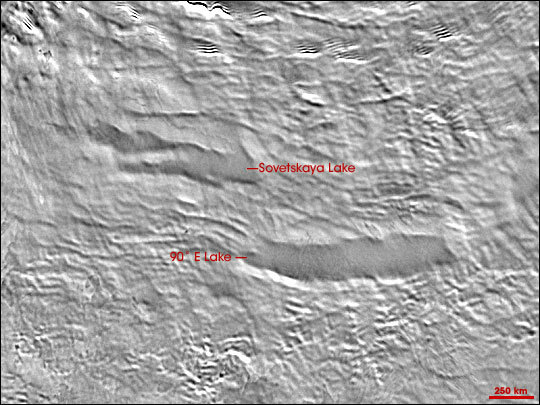 Scientists recently published the first thorough description of the size, depth, and origin of these two large lakes, called 90° East Lake (for its longitude) and Sovetskaya Lake (for the Russian research station that was unknowingly built over top it many years ago). The two lakes are close to Lake Vostok, thought to be the largest of Antarctica’s 70 or more subglacial lakes. 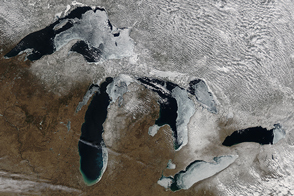 The water in the lakes is kept from freezing by warmth from the surface of the Earth and the insulation provided by the thick covering of ice. Scientists believe Vostok and the new lakes may contain unique ecosystems isolated from the outside world for tens of millions of years. The survival of life in these buried lakes could provide corroboration for the idea that life could exist in an ice-covered ocean that some scientists believe exists on Jupiter’s moon Europa. 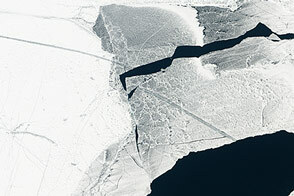 The image above is part of the satellite image collection called the “MODIS Mosaic of Antartica,” a map of the continent’s surface made from 260 images acquired by the Moderate Resolution Imaging Spectroradiometer (MODIS) sensors on NASA’s Terra and Aqua satellites between November 20, 2003, and February 29, 2004. 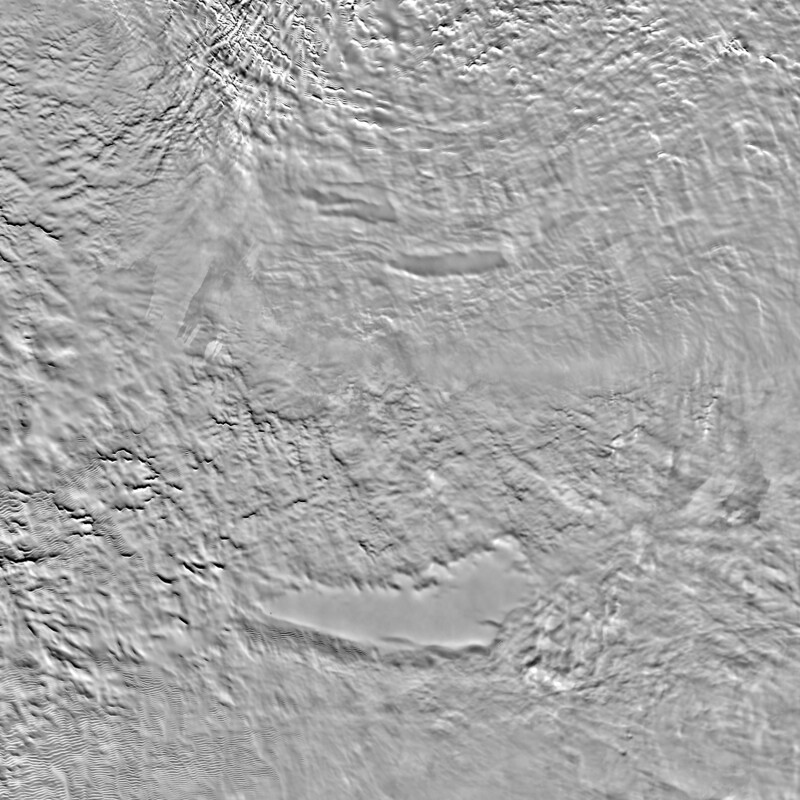 Across the rippling, crevassed whitescape of the East Antarctic Ice Sheet, two unusual shapes appear in this grayscale satellite image of the frozen continent. Bell, R. E., M. Studinger, M. A. Fahnestock, and C. A. Shuman. (2006). 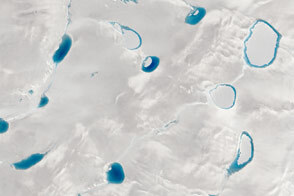 Tectonically controlled subglacial lakes on the flanks of the Gamburtsev Subglacial Mountains, East Antarctica. Geophysical Research Letters, 33, L02504, doi:10.1029/2005GL025207.